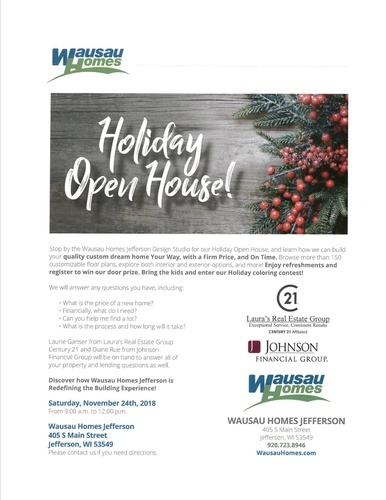 Stop by the Wausau Homes Jefferson Design Studio for our Holiday Open House and learn how we can build your quality custom dream home Your Way, with a Firm Price and On Time. Browse more than 150 customizable floor plans, explore both interior and exterior options, and more! Enjoy refreshments and register to win our door prize. Bring the kids and enter our Holiday coloring contest!